"If 1200 men couldn't hold a defensive position this morning, what chance have we with 100?" 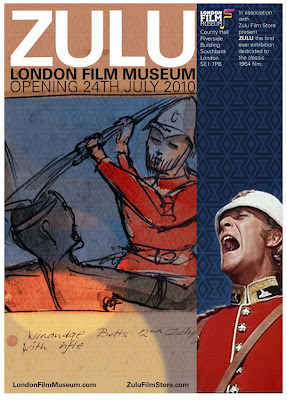 On Saturday 24th July, the London Film Museum is proud to present the first exhibition dedicated to the classic British film, ZULU. Starring Michael Caine, Stanley Baker, Jack Hawkins and Ulla Jacobsson, the film was produced by Joseph E. Levine, directed by Cy Endfield, and was released worldwide in 1964. The exhibition will include many items seen in public for the first time, including the original colour storyboards, scripts, and unpublished photographs taken by the director on set in Natal, South Africa. Also on display will be Chief Cetewayo's shield and throne tusks, and Assegais (spears) used in the film as well as some from the original battle. The storyboards were discovered in Natal last year a few miles from where the film was shot, and illustrate the "Attack on the Hospital". Dr Sheldon Hall, author of the definitive book on the making of the film, says "Until recently it was thought that no original storyboards had survived from the production of ZULU, or even existed in the first place. The recent discovery in South Africa of an extremely rare set of storyboard sketches for one key sequence is a major find for anyone interested in the film." "Contributions to the exhibition have come from right across the country and collectors have been generous in providing us with original material" says Henry Coleman from ZuluFilmStore.com, who has helped in curating the exhibition. The exhibition will be at the museum until June 2011 when it will travel to South Africa to go on display. Opening day events will include a free screening of the film, as well as a Q&A with Maureen Endfield and a lecture by Dr Sheldon Hall. As part of the opening day we shall also be collecting for Help for Heroes in recognition of the people still involved in conflict around the world.